"Glory to (Allah) Who did take His slave for a Journey by night from the Sacred Mosque to the furthest Mosque, whose surroundings We did bless,- in order that We might show him some of Our Signs: for surely He is the One Who is All Hearing, All-Seing". (The Ascension 17:1). From the Dome of the Rock in Jerusalem, he was taken physically and spiritually through time and space to witness and hear everything. The verse of the Holy Qur'an says 'in order that We might show him our signs'. The verse of the Holy Qur'an "We are nearer to you than your jugular vein" demonstrates that Allah is always near to us, not in any particular location. And Allah says that 'He is with you wherever you are'. If we become slaves of Allah and follow in the footsteps of the Holy Prophet , then this door of ascension is open until the end of time. This is the pure love and Mercy from The Merciful. If Allah had said 'Prophet' or 'Messenger', then the opportunity for this celestial travel would have been limited to them alone. If we become true slaves to the Oneness of Allah and nothing else, not slaves to our whims and fancies and ego worshipping and implement the proper discipline of this higher teaching, we will surely live our own personal Ascensions. "Prostrate yourself and draw near" (The Clot 96:19). 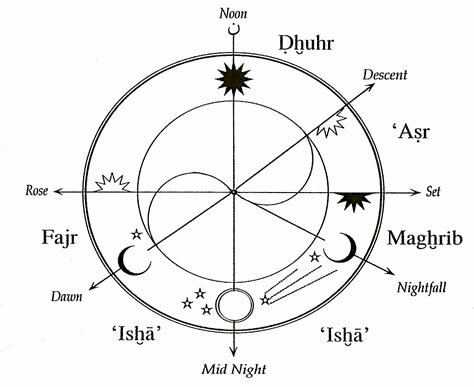 The movement of the sun and the five daily prayer times. From the "Book of the Shadhiliyya - Orisons"
2.The mention of night is not to be taken lightly. It is only at night when our senses and transitory self, our personalities and minds are quiet that we may start to experience glimpses of this great gift. What we refer to as the outer is the body, the inner is the mind; and the innermost is the Source of the body and mind; which is the spirit. Because of the simplicity and the seriousness of this journey in the Vehicle of Light, the passenger, his luggage (and his excess baggage), must be checked very thoroughly by the passenger himself. This is totally his own responsibility. "And from water We made every living thing" (The Prophets 21:30). As water gives life, so too does knowledge give life. Water here, is a symbol for knowledge - knowledge of our outer self and our inner self. Water may be used as a means to activate our consciousness - to 'check our baggage', excess or otherwise. The Holy Prophet said with regards to this "Whoever purifies himself with water, his negative actions will drip from his body until he becomes (as pure) as a newborn child". It will be of great benefit to visualise the actions that one wishes to cleanse the body of at the time of the ablution. One of the great teachers and followers of the Holy Prophet , Imam Abu Hanifa, was a man of great knowledge and unveiling. With his unveiling, he observed this saying of the Holy Prophet in action. When the people would make their ablutions, he was able to witness their bad actions dripping off of them, carried away by the water which purified their bodies. With regards to the actions of the body - we know that every action begins from the inward (intention), moves outwards, then back to the inward. Because of the way we look at things, we generally judge actions by way of the second movement. For this reason, we will concentrate for a while on the actions that are committed by our limbs and how the water is utilized to awaken the consciousness. When this occurs, then we are able to visualise and account for the returning aspect of every action on the scale of improvement. We should look at the action we have performed, deciding whether the action is positive or negative, good or bad, whether or not it benefits humanity and whether the action will bring us closer to God or take us further away from Him. The scales we use to weigh our actions are not just any scales. We cannot judge an action as correct just because we think it is right or because our friends happen to agree with us - or because the majority of society seems to think it is correct. Certainly these are not the scales we speak of. The Vehicle of Light is a method, which has been introduced and perfected by 124,000 of the greatest teachers of mankind, the prophets of God. The scales we will use to measure our actions are the Divine Scales. "The Most Gracious! It is He who has taught the Qur'an. He has created man: He has taught him intelligent speech. The sun and the moon follow courses exactly computed; and the herbs and the trees, both alike bow in adoration. And the firmament He has raised high, and He has set up the Balance of Justice, in order that ye may not transgress due balance. So establish weight with justice and fall not short in the balance" (The Merciful 55:1-9). "Soon will We show them our Signs in the cosmos, and in their own selves, until it becomes manifest to them that this is the Creative Truth. Is it not enough that thy Lord does witness all things?" (Explained in Detail 41:53). "Just as [there are signs thereof] within your own selves: can you not, then, see?" (The Winds that Scatter 51:21). And the Holy Prophet said, "Whoever knows himself, he will know his Lord". The real meaning of these verses will open the doors of consciousness. Then, the meaning of the saying of the great master Junayd "make your ablution with the water of the Unseen if you are a man of Secrets"3 , will become apparent. When the mind reaches this stage, it will know its own worth and realise that its place is behind the heart and not before it (that is, to be led by the heart, rather than leading it). It will hear and try to obey the saying of Junayd "Follow a leader whom you used to lead". The Holy Prophet said "I am the City of Knowledge and Ali is her gate". When the great master Ali ibn Abi Talib, may Allah be pleased with him, made ablutions in preparation for his prayer, his complexion would turn pale and yellow and he would tremble. When people asked of him the reason for this, he replied "Do you not know before Whom I am about to stand?" This great teaching of the final Prophet is so powerful and unique that every activity starts from its intention, not random action and habit. The awareness of our purpose in entering the Vehicle of Light should always be present within us and that goes for every other action from the time we wake up from our sleep and slumber to the moment we go back to rest again. When you are out of prayer, be as if you are in the prayer - this is remembrance. When you say, 'By Thy Name I live and die', there is no activity, no matter how small or large, without this awareness. This is called the Sunnah; in a nutshell, the higher awareness of the Real which is the practice of the Universal Man. 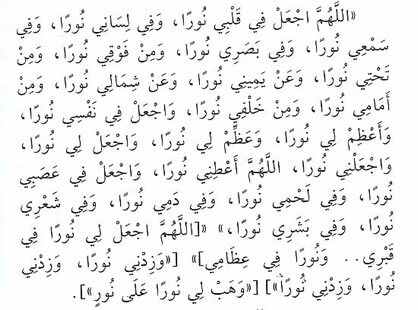 Sayyida Nafisah, the granddaughter of the Holy Prophet , was once asked what she thought of Imam Shafi'i, who, according to the Saints of Allah, was the Qutb (Pole) of his time. She replied "I think he is a man who knows how to make ablutions (wudhu)". This is a great statement from one of the great women of Islam. She is the one who read the entire Holy Qur'an 170,000 times in her grave before she died. When she was asked about this practice, she replied "I would like to put some light in my house before I enter it". In our time, people live and die without reading the whole Qur'an even once and the highly religious may spare a bit of time in the Holy month of Ramadhan for reading. We should make reading a certain measure of the Holy Qur'an part of our daily practice and to read what we know inside the Vehicle of Light to transport ourselves and to connect with the Real. 3. The Subtle Centres of the Heart (Lata'if) are known as The Heart, Spirit, Secret, The Hidden, and The Innermost. Regarding, the ablution, the Holy Prophet once asked his companions whether a man who washed himself five times a day in a running stream would have any dirt left on him. They answered that surely he would not. The Holy Prophet then added that performing the prayer (salat) five times each day removes all negative thoughts and bad actions from a person and removes all his 'dirt'. There are three levels from which we perceive knowledge. 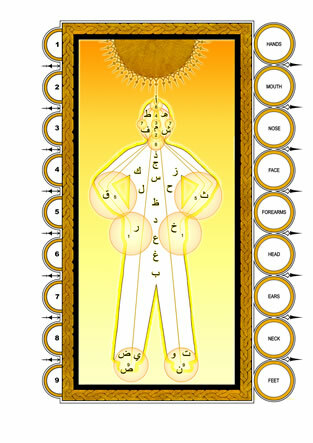 These are the physical realm (Nasut), the angelic realm (Malakut), which is the level of the pure intellect; and the Divine realm (Lahut). Performing the ablution (wudhu) with consciousness and awareness of every limb will increase the sensitivity of our being so that we will be able to experience the primordial self (Ayan ul Thabita) in the presence of Allah. For this reason the Beloved of Allah, The Holy Prophet Muhammad said "It is better to wait 40 years and turn to ashes than to pass in front of a person in prayer". The one in prayer is in direct communication with his or her Lord. To interrupt the energy flow by carelessly passing in front of such a person is very serious indeed as this blocks the mirror of the heart from reflecting the Divine. The eye of the heart has the same sensitivity as the eye of the head. Even something as small as an eyelash or grain of sand can make us feel uncomfortable and irritated. Allah has said, "Neither My Heavens or My Earth contain Me, but the heart of My true believer contains Me". This 'containment' does not refer to space, because Allah is beyond space and time. This is containment of knowledge in the heart (ma'arifa). "He it is Who created the heavens and the earth in six Days - and His Throne was over the waters, that He might try you, which of you is best in conduct" (Hud 11:7). "Do not those that are veiled and blind to the Truth see that the heavens and the earth were joined together (as one unit of creation), before We clove them asunder? We made from water every living thing. Will they not then believe?" (The Prophets 21:30). There are many types of physical purification in the teachings. The first is known as ghusl, and involves washing of the entire body. The second is the wudhu, or ablution and the third method we will touch on is called tayammum, which is to use natural rock or pure earth to obtain purification for worship and prayer. First, we must understand that our aim is to enter the presence of Allah, and the purification required is the transformation of the inner self from such base qualities as envy, greed, hatred, etc. To perform the physical purification with this awareness will be of great benefit to our spiritual development and this is called 'taking account' (muhasaba). This is to be performed before you proceed further in the preparations for your spiritual journey. The most powerful energies contained within us as human beings are the spiritual energy and the physical energy, which manifests in the form of sexual energy. When we utilise this energy, we enter into a creative state, forgetting our selves. If this available energy is used for a spiritual purpose, great benefit is brought to our spiritual development. When this energy is dispersed, then one is required to wash the entire body to bring about the state of awareness and equilibrium that was lost during the physical act, which momentarily brought about a state of forgetfulness. It is compulsory to wash the entire body (ghusl) after marital relations, wet dreams, after the woman's monthly cycle, and after the time of childbirth. Any activity that causes the loss of energies relating to the reproductive system requires us to wash the entire body, thus restoring us to a state of awareness. So it becomes necessary to use water, the symbol of knowledge, to restore us to our awakened state. As we know, each of us creates with his imagination before it becomes manifest in the physical realm. An example of this creation would be art. Even though the inspiration for works of art comes from a higher realm, we ascribe that inspiration to ourselves and this is where we lose the Reality of the art itself. The highest form of creation is the human being because he has the capability to know Divinity, even though the Divine Essence of Allah is beyond knowing. Anyone who claims that they have reached the Divine Essence has indeed severed his connection with Divinity and the Divine because of the arrogance of the ego. 'Man qaala qad wasl, faqad infasl' (Who said, 'I have reached', surely he has been disconnected). That is the beauty of travelling within the Vehicle of Light - it is a never ending journey. Because of this ability to know Divinity, we have been placed as the viceregent of God upon the earth. The 'Throne of Life' is the Divine force which made it possible for every thing to exist. This is water as in the above verse of the Holy Qur'an 'We made from water every living thing'. We do not want to go too deep into explanations of this particular verse - it is enough that God Himself has stated that His Throne is above the waters, which is a powerful symbol and a truth. We are made of water and without water we perish. In the 21st century, the thinkers of the world and the researchers, the white coated priests of the labs, are telling us that the 3rd World War will happen because of the scarceness of resources, particularly water. We do agree with such conclusions, but from a different perspective. "There is no moving creature on earth but its sustenance depends on Allah. He knows the time and place of its definite abode and its temporary deposit: All is in a clear Record" (Hud 11:6). With all the modern technology available to mankind, there is plenty to go around - the problem is not with God, the problem is with humans. They are greedy, stingy, selfish, self-serving, manipulative, and power-hungry. We can see it on our colour televisions day in and day out. Cyclones, tornadoes, earthquakes, tidal waves - these are caused by the condensation of evil and negative actions and a severe disconnection from the Creative Truth. You could say that we have abandoned Allah, Almighty God, so we are now living in an asylum without doctors. The driving force is the 'me, me, me' concept with everybody falling in love suddenly and with an extreme rush to embrace their ugly self, that horrible child within, that which we call the 'ego self'. 'The terrible twos' of modern man have brought down on us the temper tantrums of two millenniums. This is the Dajjal, or the Antichrist. The self that is blind to the truth only sees with one eye - the material eye. We hoard everything and we have poisoned everything. We destroyed our environment and only attempted to 'close the gate after the horse had bolted'. The horse of our self is out of control and running wild. As one of the great Sufi Saints has said "Never in the history of humanity has civilization been built purely on material foundations, and this is very dangerous". The water that the scientists have mistaken for the H2O that they are familiar with is in reality, true knowledge - knowledge of God, knowledge of the sacred and knowledge of our own selves. This is the 'Water of life'. If we don't find it, then, indeed, we will be in a cataclysmic situation. As the saying goes, "man cannot live by bread alone". "For each (such person) there are (angels) in succession, before and behind him: They guard him by command of Allah. Verily never will Allah change the condition of a people until they change it themselves (with their own souls). But when (once) Allah wills a people's punishment, there can be no turning it back, nor will they find, besides Him, any to protect" (The Thunder 13:11). This word of Allah has many interpretations by the people of knowledge and the people of higher understanding tell us that every human being is born pure and clean with Divine protection; with all of the creation to assist and help him to attain to felicity. But if they change from their original nature and counterfeit themselves, grafting onto a false reality; you could say then that 'all Hell breaks loose'. Then people cry out 'Where is God?' 'Why doesn't He help?' They have severed their own communication wires, they never built their spiritual house on solid foundations, and then they are surprised to find that when they finally pick up the spiritual phone to make a call, there's no dial tone. Everyone understands quite well what happens when we don't pay our bill to the phone company. First, you get a reminder, then a warning, and then your service is disconnected. It is the same with God. He has sent humanity 124,000 reminders and warnings, in the form of Prophets and Messengers, and millions of Saints and teachers of God, yet we still pay no heed. For Allah's sake people, let's take stock of ourselves and renew our relationship with the One who created us, gave us life and provided us with heaven and earth, so that we may become the true viceregent of the Most Merciful. So let's clean and purify our selves, both inward and outward, and return back to the Straight Path (al Sirat al Mustaqeem) by washing our hearts with the tears of repentance and putting on the clean garment of love of Allah and His Messenger . Let's keep our selves and our homes clean and free from rubbish and filth so that we may quench our thirst with the celestial waters of real knowledge and put the light in our hearts so that the inner eye will see clearly the way of success. No one arrived in this world of his own accord, with the family, location and arrival time of his choosing. We all arrived without any pockets (or bank cards to put in them) and we leave the same way. That is something that no one will ever be able to change. The only change is that when you return, all of the years that you have stayed on earth, wining and dining as they say, without any concern for other human beings or their well being, those activities, those deeds, that account will travel inward with you and will have to be settled. From an observer's point of view, the moment that we die is very similar to sleep in the way that we can look at someone sleeping without being aware of his inner condition. If he is having a nightmare - it is his own private nightmare. It is the same with death. For those who accumulate within themselves heedless actions and do not make any attempt to awaken their consciousness during their stay on earth, when their last breath is exhaled, the account becomes due. No one gets off scot-free - you have to pay - it's the cosmic, Divine law. Things have not been going so well lately for our Mother Earth and that is all because of the mischievous children running upon her without any proper direction or teaching to pull themselves from darkness to light, from nightmares to beautiful dreams and visions, from stinginess to generosity and kindness, from hatred to respect and love, from sickness to blooming health and strength, from stupidity to knowledge and understanding, from 'me, me, me', to 'we, we, we'. The greatest communities and societies and nations give birth to wonderful human beings who care for one another and love one another because they understand that the life of this world is transitory. "Oh, Allah, place light in my heart, light in my tongue, light in my hearing, light in my sight; light above me and light below me, light on my right, light on my left, light in front of me, light behind me, place light in my soul; magnify for me light and amplify for me light; make for me light and make me light. Oh Allah, grant me light and place light in my nerves, in my body light; in my hair light and in my skin [Oh Allah, make for me a light in my grave and a light in my bones][Increase me in light, increase me in light, increase me in light]. [Grant me light upon light]". And may all the most beautiful and fragrant salutations and peace and blessings be upon our beloved of the Beloved, Muhammad, al Mustapha, his family, his wives his children and his companions and the companions of the companions and all of those who follow his way from the beginning of time to the end of time and beyond time. Wa ma tawfiq illa billah. (And there is no success except through Allah).